This is a REAL pickle. If five states are not compliant with the Real ID Act, their state-issued driver’s licenses will be invalid to board an airplane, including a domestic commercial airplane. The five states affected are Illinois, Minnesota, Missouri, New Mexico, and Washington state. Because the equipment and methods used for their driver’s licenses are not in compliance with the standards of the Real ID Act, ordinary people will NOT be allowed on board any commercial airplane even to travel within the United States even if they present a driver’s license from these named five states. To put it mildly, this is the federal government at its MOST INCOMPETENT. Of course the State of Illinois will not comply with the Real ID Act because it has NO money to do so. Apparently it has not occurred to the federal government, nor the U.S. Department of Homeland Security, that Illinois is officially broke and cannot do anymore for trying to make Illinois driver’s licenses secure than it is doing now (and in defense of the State of Illinois, it takes a good deal to get an Illinois driver’s license. It takes at least a birth certificate, a Social Security number that can be verified, and a driver’s license from another state that Illinois accepts). The Real ID ACT was passed at a time of extreme hysteria over terrorism, and the reason almost none of the states could comply with this stupid law is because the Act sets the bar way too high and demands states to spend an inordinate amount of money to comply with the Act. And in the end this will NOT stop terrorists—the very thing that the Act was supposed to do in the first place. What it will do is cause millions of innocent Americans to be unable to get on board an airplane, make it hard if not impossible for domestic airlines to accommodate passengers from these five states, and cost the economy billions of dollars in lost revenue because people will be unable to get on board an airplane. This can have a detrimental effect on the national economy, and will mean that the airline industry, tourism and the economies of just about every state will suffer. With all of these probable catastrophic consequences, what is the point of the Real ID Act? I find it perturbing that U.S. President Barack Obama will be spending a great deal of time on gun control, but will not deal with what could become a disaster. I will be more than happy when his time in office is over. As for this issue, I can only hope that more rational heads prevail and grant these states further extensions. 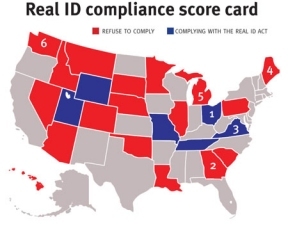 Ideally, we should simply get rid of the Real ID Act altogether. It is a poor law made in a rather dark time period.